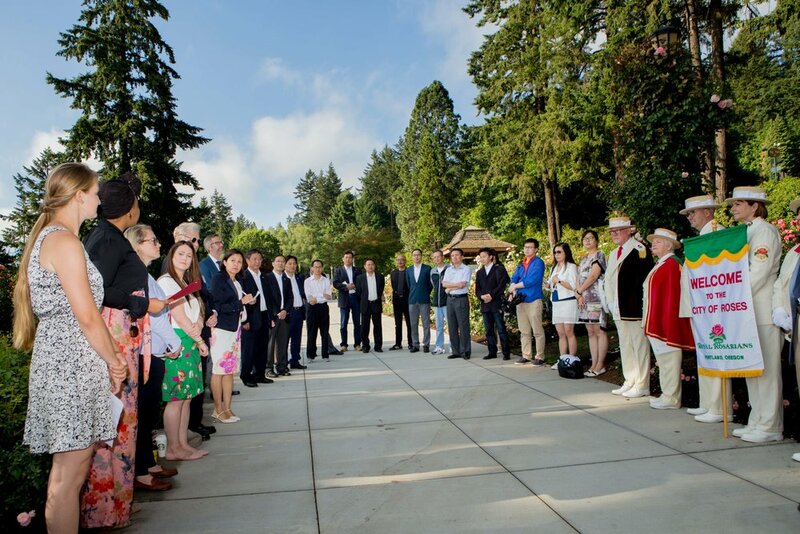 July 28, 2018 PSSCA Rose Bed Dedication and Tree Planting Ceremonies Celebrations of the 30-year Portland-Suzhou Sister City anniversary began Saturday morning, July 28, 2018, with the dedication of a rose bed in Washington Park. On behalf of Portland Parks and Recreation, Rachel Burlington, Curator of the International Rose Test Garden welcomed the delegations from Suzhou led by Mr. Gu Jie, Secretary General of Standing Committee of Suzhou Municipal People’s Congress. The City of Portland’s Mayor Ted Wheeler, International Relations Director, Chido Dhliwayo and Portland-Suzhou Sister City Association (PSSCA) President, Bob Fraser, addressed the group of delegates, PSSCA Board Directors and Royal Rosarians. The Mayor and Mr. Gu Jie, together planted and watered a rose bush in the rose bed dedicated to the PSSCA. The group then reassembled at the Hoyt Arboretum where they were met by Hoyt Curator Martin Nicholson. 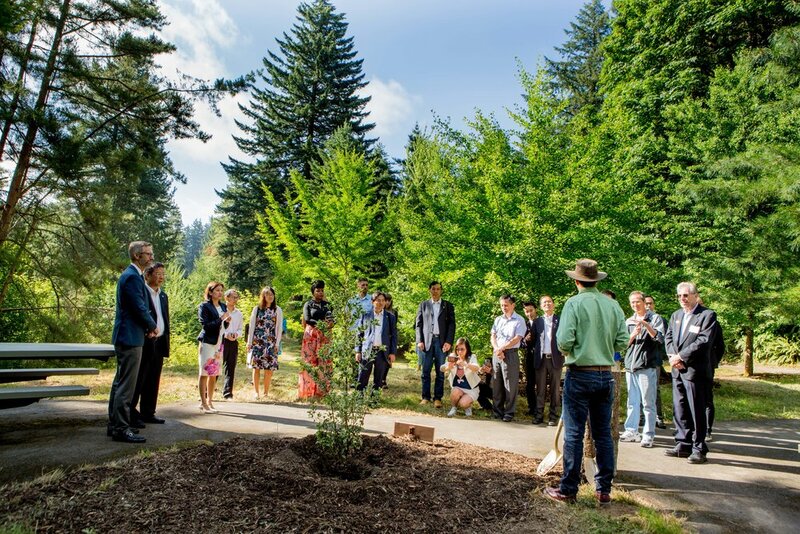 A scenic walk along the Bristlecone Pine Trail brought them to the area in the Hoyt Chinese Forest where an Osmanthus heterophyllus “Variegatus’ was planted in honor of 30 years of sister city relations between Suzhou and Portland. This tree is a twin of a tree to be planted in the Lan Su Chinese Garden, both propagated from the 100 year old Osmanthus nicknamed “Old Gui” or old noble one, that resided in the Lan Su courtyard until recently. The group heard remarks by Martin Nicholson, Elizabeth Edwards, City of Portland Director of the Office of Government Relations, Lynne McIntyre, Immediate Past President of PSSCA, Mayor Ted Wheeler and Mr. Gu Jie. 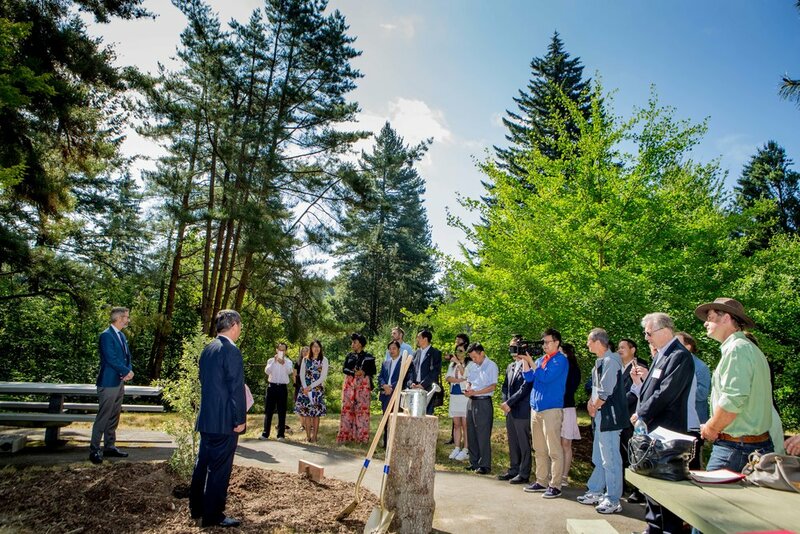 The tree planting at Hoyt was a fitting follow up of the tree planting ceremony that took place in Suzhou during the Mayor’s delegation in April. Older PostSuzhou Chinese Orchestra's "Charm of Chinese Music"